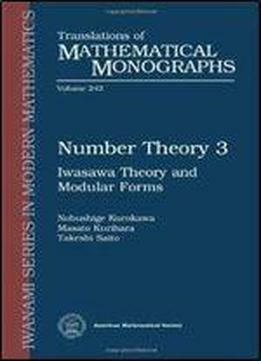 This is the third of three related volumes on number theory. (The first two volumes were also published in the Iwanami Series in Modern Mathematics, as volumes 186 and 240.) The two main topics of this book are Iwasawa theory and modular forms. The presentation of the theory of modular forms starts with several beautiful relations discovered by Ramanujan and leads to a discussion of several important ingredients, including the zeta-regularized products, Kronecker's limit formula, and the Selberg trace formula. The presentation of Iwasawa theory focuses on the Iwasawa main conjecture, which establishes far-reaching relations between a $p$-adic analytic zeta function and a determinant defined from a Galois action on some ideal class groups. This book also contains a short exposition on the arithmetic of elliptic curves and the proof of Fermat's last theorem by Wiles. Together with the first two volumes, this book is a good resource for anyone learning or teaching modern algebraic number theory.